I admit, I didn't really generate interest in Percy Jackson until the movie came out. And you know, I like to read the book before I see a movie adaptation. So, I did. It was a very entertaining and fast (it can be done in one sitting) read. 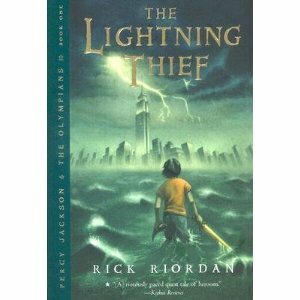 I was impressed with how Rick Riordan weaved the Greek myths into real life. Many kudos for his creativity. For example, how Aunt Em's (Medusa's) garden was full of stone statues. Clever. And doubly fun to try to guess which god Percy encounters before Percy realizes who he/she is. The kids love it for good reason. However, it doesn't have the depth/double meaning/symbolism of Harry Potter, but it is just as entertaining. The movie was TERRIBLE. They added 5 years to Percy's age, so that he's a teenager and has hormones and can drive. They made Annabeth into this weird war-like goth girl, who Percy is now romantically interested in. They made Grover African-American (not that that was bad, it just didn't jive with his character in the book at all) and he was portrayed as comic relief only. UGH! So bad. For those of you who saw the movie first, read the book. It's ten times better.